We’re all familiar with top, a real-time system monitor. Some prefer htop and previously I mentioned iotop for disk read/write monitoring. Lets looks at another popular tool for Linux server performance analysis: atop. Shows resource usage of ALL processes, even those that are closed/completed. Monitors threads within processes & ignores processes that are unused. Accumulates resource usage for all processes and users with the same name. Highlights critical resources using colors (red). Will add or remove columns as the size of the display window changes. Includes disk I/O and network utilization. Uses netatop kernel module to monitor TCP & UDP and network bandwidth. Once atop is launched, by default it will show system activity for CPU, memory, swap, disks and network in 10 second intervals. In addition, for each process and thread you can analyse CPU utilization, memory consumption, disk I/O, priority, username, state, and even exit codes. First install and enable EPEL (Extra Packages for Enterprise Linux) repo. See: RedHat solution #308983.
a – sort in order of most active resource. c – revert to sorting by cpu consumption (default). d – sort in order of disk activity. Once you open a log file (eg. atop -r /var/log/atop/atop_20140813) then use t to go forward in 10 minute intervals and T to go back. You can analyse specific times by pressing b then entering the time. The above shortcut keys also work in this mode… a, c, d, m,n. Using the flag -A with return all available reports. 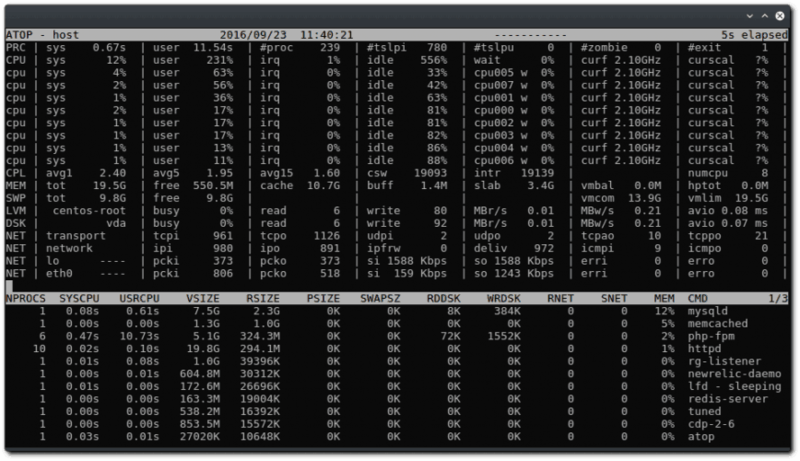 top, htop, nmon, net-tools, iptraf, collectl, glances, iostat and vmstat. ← Logagent: The Swiss Army Knife for Log Processing?